In our wine cellar we store over five thousand bottles of an enormous variety of wines coming from Piedmont to Sicily and including Sardinia Some of the best wines in the world are from Italy and in Tuscany we are particularly proud of the reds; not only the deservedly famous Chiantis but Brunello di Montalcino and Bolgheri doc too. In a seperate area we keep large fridges able to hold large fresh meat sections (we butcher the meat ourselves), plus we have hanging areas for the hams and smoked meats, shelving for cheeses and olive oil and a dry food storage area. 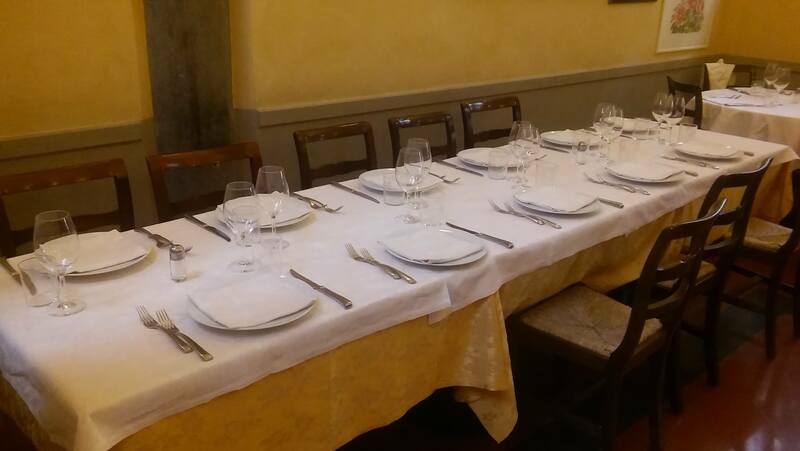 We also keep a few tables prepared just in case things get really busy upstairs, but more and more often guests are asking to be seated “in the cellar”! This the absolutely perfect place for you if you like to to be out of the hustle and bustle of the upstairs dining rooms, and is a delightful and private venue for closed private events (birthdays, anniversaries etc) and work functions. Should you like to try the unique experience of eating in a brick vaulted cellar surrounded by hundreds of bottles of wine, just ask!